Sometimes the mouse pointer is hard to see. You can lose track of its location. Here's how to make the mouse pointer more visible. 2. Click on Mouse icon to open the Mouse Properties dialog box. 3. In the Mouse Properties dialog box select Pointers tab. In the Scheme section, from the drop-down list, select Windows Default (large)(system scheme). Then click [Apply] and [OK] buttons. Note: You could also select Windows Default (extra large)(system scheme). 4. 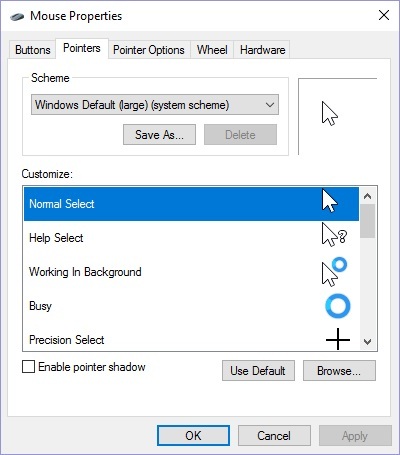 For more options to make your mouse pointer more visible, in the Mouse Properties dialog box, select the Pointer Options tab. 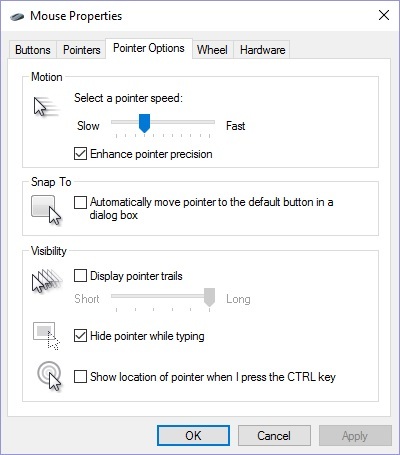 In the Visibility section, set the  Display pointer trails check box, and/or set the  Show Location of pointer when I press the CTRL key check box.